A few weeks ago, my girlfriend/Little Chef Claire swung by our local favorite Di Brunos to pick me up a little treat. She didn’t know what she was going to get me, but she knew that she wanted to pick up something amazing. 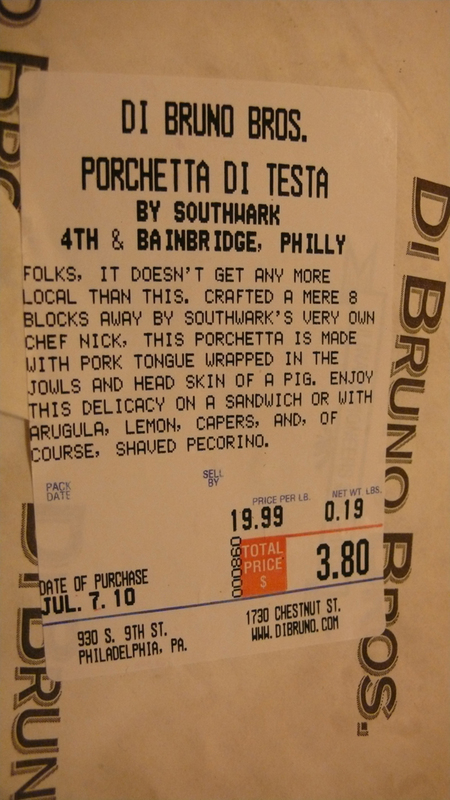 She asked our usual clerk for a recommendation; knowing my fondness for organ meat and the noble swine he picked a combination of Porchetta di Desta and Pecorino Romano. Claire picked up just enough for a few sandwiches and surprised me on an already lazy day off. And made a few blocks from our house? Great choice. Thick cut sourdough bread, honey mustard, cheese and meat. Lightly grilled with a pinch of milled garlic on the crust and it made for a very welcome lunch. That’s why she’s my little Chef!